CropStop: Giveaway in our Fan Facebook Page! Giveaway in our Fan Facebook Page! Your favorite Magnolia images in smaller sizes to make them even more versatile and perfect for all your paper crafting projects. Do you have a favorite Edward or Tilda? Or a paper-craft project using one? 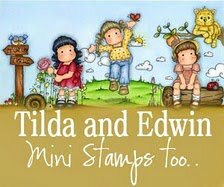 Let us know or show us your project for your chance to win one of these cute new stamps! Visit our CropStop Facebook Page before noon September 1st (EST) and leave us a comment or picture using your Magnolia Stamp project.